Dopamine-producing cells are generated within the embryonic ventral midbrain, and this process has been shown to require a complex network consisting of a host of transcription factors and signaling pathways (Perrone-Capano et al., 2000; Riddle and Pollock, 2003; Simon et al., 2003). Because the dopaminergic pathways in the midbrain have been closely associated with serious neuropsychiatric disorders, the elucidation of the mechanisms underlying dopaminergic neuronal development should provide some important clues as to possible treatments for related disorders. Transcription factors including Ptx3 (paired-like homeodomain transcription factor 3 or pituitary homeobox 3) and the nuclear orphan receptor Nurr1 have been demonstrated to play a critical role in dopaminergic neuronal development (Perrone-Capano and Di Porzio, 2000; Perlmann and Wallen-Mackenzie, 2004). However, despite a variety of interesting findings, many components of the networking of signaling pathways remain to be found, and the mechanisms underlying the development of dopaminergic neurons remain a matter for additional study. Dopamine has been found to regulate neuronal development via dopamine receptors (Todd, 1992; Schmidt et al., 1996). In previous studies, dopamine has been reported to increase neuritic elongation in embryonic rat cortical neurons via the activation of D2-like receptors (Todd, 1992). However, dopamine can also inhibit growth cone motility and neurite outgrowth in avian retinal neurons via the stimulation of D1-like receptors (Lankford et al., 1988). Therefore, depending on the receptor type and probably also on the signaling pathway exploited, the dopaminergic regulation of neuronal development appears to occur in a variety of ways. However, the molecular mechanisms underlying such dopamine receptor-induced regulation have yet to be clearly elucidated. To better characterize the role of dopamine in neuronal development, occurring via dopamine receptors, and specifically the D2 receptor (D2R), we attempted to determine the manner in which an absence of D2R affects dopaminergic neuronal development in mice lacking the D2 receptor (D2R−/−) (Baik et al., 1995; Usiello et al., 2000). We determined that, in the absence of D2R, dopaminergic neuronal development was blunted in association with altered Nurr1 and Ptx3 expression in these mice. We also demonstrated that D2R interacts with Nurr1 via extracellular signal-regulated kinase (ERK) signaling and that D2R-mediated signaling is critical for the activation of Nurr1 and for dopaminergic neuronal development. Animal preparation and mesencephalic neuronal cell culture. The D2R−/− mice and wild-type (WT) littermates originated from the mating of heterozygous of D2R−/− mice, identified by Southern hybridization analyses as described previously (An et al., 2004). Insemination was confirmed by vaginal plug and considered to be embryonic day 0 (E0). Pregnant mothers were killed in accordance with Society for Neuroscience guidelines at E14. To prepare primary mesencephalic neuronal cultures, the mesencephalon dissected from 14 d gestation mouse embryo was incubated with 0.1% of trypsin in HBSS for 10 min at 37°C and triturated with a constricted Pasteur pipette in high-glucose DMEM media supplemented with 10% FBS (Invitrogen, San Diego, CA), 1.4 mm l-glutamine, and 6.0 g/L glucose. DA neurons were plated at 1.0 × 105 cells per 18 × 18 mm coverslip (Marienfeld, Lauda-Konigshofen, Germany) or 2.0 × 105 cells per six-well plates precoated with 50 μg/ml poly-d-lysine and 2 μg/ml laminin (Sigma, St. Louis, MO). DA neurons were maintained at 37°C in a humidified 5% CO2 atmosphere in Neurobasal media supplemented with B27 and GlutaMax-1. At 5 d in vitro, the DA neurons were incubated with Neurobasal media without B27 supplement and treated with various experimental reagents for the time periods indicated. 1-Methyl-4-phenylpyridinium (MPP+) (Research Biochemical, Natick, MA) was dissolved in culture medium and added at the concentration specified for 24 h.
DA neurons were treated with 1 μm quinpirole every 12 h in the presence and absence of 1 μm haloperidol or pretreated 50 μm 2-(2-amino-3-methoxyphenyl)-4H-1-benzopyran-4-one (PD98059) for the duration of the experiment. Immunocytochemistry and dual fluorescent staining. DA neurons were fixed with 4% paraformaldehyde for 20 min at room temperature (RT) and blocked for 1 h in PBS containing 5% normal horse serum and 0.2% Triton X-100. Then the neurons were incubated with a rabbit polyclonal anti-tyrosine hydroxylase (TH) (1:1000; Pel-Freez, Rogers, AR) in PBS containing 1% normal horse serum and 0.2% Triton X-100 at 4°C overnight, and followed by staining according to avidin–biotin immunohistochemical procedures (Vector Laboratories, Burlingame, CA). Using a microscope, cell counts were made in randomly selected unbiased counting frames (>40 frames out of 81 grid were counted). Average length of neurite in TH-positive neurons was analyzed under a microscope equipped with MetaMorph imaging system (Universal Imaging Corporation, West Chester, PA) in 20 randomly selected fields (10× objective) per each slide. A neurite length was defined as the distance from the soma to the tip of the longest branch. Average length of neurite represented the divided value of total neurite length to the number of neurites per cell. The neurites shorter than 10 μm were excluded from morphometric analysis. For dual fluorescence labeling, fixed cells were incubated a rabbit polyclonal anti-TH (1:1000; Pel-Freez) and a mouse monoclonal anti-phosphorylated ERK (p-ERK) (E10; 1:200; Cell Signaling, Beverly, MA), or a mouse monoclonal anti-TH (1:1000; Diasorin, Stillwater, MN) and a rabbit polyclonal anti-Nurr1 (M-196; 1:200; Santa Cruz Biotechnology, Santa Cruz, CA) at 4°C overnight. After washes with PBS containing 0.2% Triton X-100, the DA neurons were incubated at RT for 1 h with Alexa Fluor 568 goat anti-rabbit IgG and Alexa Fluor 488 goat anti-mouse IgG (1:200; Invitrogen, Eugene, OR) for a double localization of TH and p-ERK, or TH and Nurr1 in PBS containing 1% normal horse serum and 0.2% Triton X-100. As a negative control, the DA neurons were incubated with the secondary antibody only. p-Erk-positive or Nurr1-positive neurons among TH-positive neurons were examined under an Axiovert 200 microscope equipped with epifluorescence unit and Axiocam Digital Camera (Zeiss, Zena, Germany) and analyzed under a real-time confocal microscope system with Nikon Eclipse fluorescence microscope (TE2000-U; Nikon, Kanagawa, Japan) and Ultraview RS confocal scanner (PerkinElmer, Wellesley, MA). Confocal fluorescence image (20× objective) stimulated by 488 and 568 nm laser was filtered by green emission filter and red/blue dual-emission filter, respectively. Colocalization of Nurr1-positive cells among TH-positive neurons were scored by examining >200 TH-positive neurons from randomly acquired neuronal images (10× objective) in each condition. DA neurons prepared from more than six embryos of wild and D2R−/− genotypes were analyzed in each condition. Western blot analysis of p-ERK. After treatment with 10 μm quinpirole for 15 min in the presence and absence of PD98059 (50 μm for 30 min) or haloperidol (1 μm for 5 min), the DA neurons were washed with ice-cold PBS and lysed in a buffer containing 20 mm Tris, pH 7.5, 150 mm NaCl, 1 mm EDTA, 1 mm EGTA, 2.5 mm sodium pyrophosphate, 1 mm glycerol phosphate, 1 mm Na3VO4, 1 μg/ml aprotinin, 1 μg/ml leupeptin, 1 mm PMSF, and 1% Triton X-100 for 10 min on ice. Cells were homogenized with probe type sonicator on ice, and followed by centrifugation at 13,000 × g for 10 min at 4°C. Protein (∼50 μg) was separated on a 10% SDS-PAGE, blotted onto prewetted polyvinylidene difluoride nitrocellulose membrane. Primary antibodies used were a mouse monoclonal anti-p-ERK (1:2000; Cell Signaling) and a rabbit monoclonal anti-ERK (1:5000; Santa Cruz Biotechnology). Specific bands were detected by enhanced chemiluminescence (Amersham Biosciences, Piscataway, NJ) and analyzed by LAS3000 image analysis system (Fuji, Tokyo, Japan). For immunohistochemical studies, the heads of wild-type and D2R−/− mouse embryos (E14) were fixed in 4% paraformaldehyde for overnight at 4°C and soaked in 20% sucrose for 24–48 h. In the case of postnatal day 30 (P30) stage mice, the mice were transcardially perfused with 4% paraformaldehyde. The brains were postfixed with fixative and kept in 30% sucrose for 24–48 h. Free-floating cryostat sections (40 μm) were serially prepared for TH and Nurr1 immunohistochemistry. Sections were washed in 0.1 m PBS, pH 7.4, three times for 10 min and then placed in 0.1 m PBS solution containing 0.3% H2O2 and 50% methanol for 30 min. Sections were incubated in a blocking solution (0.2% Triton X-100, 1% BSA in 0.1 m PBS) for 30 min and then overnight in primary antibody (rabbit anti-TH; 1:1000; Pel-Freez; rabbit anti-Nurr1; M-196; 1:100; Santa Cruz Biotechnology) at 4°C. This was followed by incubations at room temperature in biotinylated secondary antibody (anti-rabbit IgG; 1:500; Vector Laboratories) for 30 min, and then in ABC kit (Vector Laboratories) for 30 min. Sections were then reacted with DAB (Vector Laboratories). PBS (0.1 m) rinses (three times for 10 min) were performed between each step. Sections were mounted, dehydrated, and coverslipped. The unbiased stereological estimation of the total number of the TH-positive and Nurr1-positive cells in the substantia nigra (SN) and ventral tegmental area (VTA) was made using the optical fractionator (West, 1993). The Computer-Assisted Stereological Toolbox system, version 2.1.4 (Olympus, Ballerup, Denmark) equipped with an Olympus BX51 microscope, a motorized microscope stage (Prior Scientific, Rockland, MA) run by an IBM-compatible computer, and a microcator (Heidenhain ND 281B) connected to the stage and feeding the computer with the distance information in the z-axis was used. The borders of the SN at all levels in the rostocaudal axis were defined. The medial border was defined by a vertical line passing through the medial tip of the cerebral peduncle, by the medial terminal nucleus of the accessory nucleus of the optic tract for excluding the TH-positive cells in the VTA. The ventral border followed the dorsal border of the cerebral peduncle, including the TH-positive cells in the pars reticulata, and the area extended laterally to include the pars lateralis in addition to the pars compacta. The sections used for counting covered the entire SN from the rostral tip of the pars compacta back to the caudal end of the pars reticulata (anterioposterior, −2.06 to −4.16 mm from bregma) (Paxinos and Franklin, 2001). The SN or VTA was delineated at a 1.25× objective and generated counting grid of 150 × 150 μm. An unbiased counting frame of known area (47.87 × 36.19 μm = 1733 μm2) superimposed on the image was placed randomly on the first counting area and systemically moved through all counting areas until the entire delineated area was sampled. Actual counting was performed using a 100× oil objective. The estimate of the total number of neurons was calculated according to the optical fractionator formula (West, 1993). More than total 300 points over all sections of each specimen were analyzed. Counting parameters for E14 mouse embryonic brain differed slightly from those set for P30 mouse brain. Because of the size of SN and VTA, the counting grid was reduced to 100 × 100 μm. Counts represent the total value combined both of hemispheres. The volumes of SN and VTA were also analyzed by the method of Cavalieri's principle (Gundersen et al., 1998), and no considerable changes between WT and D2R−/− mice were observed. Human embryonic kidney 293 (HEK293) cells were grown in DMEM (Invitrogen) with 10% fetal bovine serum and transfected with dopamine receptors, Nurr1, and Nur response element (NurRE) using jetPEI transfection reagent (QBiogene, Carlsbad, CA) by the procedure recommended by the manufacturer. Briefly, 5–7 × 105 cells confluent monolayers of HEK293 cells were transfected with 1.5 μg of pSV-D2R or pSV-D1R, 1.5 μg of pCMX-Nurr1, 1.5 μg of pXP1-luc containing POMC gene promoter and three copies of the NurRE (pXP1-NurRE-luc), and 0.5 μg of pCH110. In case of the transfection with Ras dominant-negative mutant, cells were transfected with 1.0 μg of pMT-RasN17 or pSK-null vector, 1.0 μg of pSV-D2R, 1.0 μg of pCMX-Nurr1, 1.0 μg of pXP1-NurRE-luc, and 0.5 μg of pCH110. After 3 h, the transfection mixture was replaced with fresh growth medium. Assays were performed 48 h after transfection. Cells were preincubated overnight in serum-free growth medium before treatment with agonists. The cells were treated with various concentrations of dopamine or [±]-6-chloro-7,8-dihydroxy-1-phenyl-2,3,4,5-tetrahydro-1-H-3-benzazepine hydrobromide (SKF81297), respectively, for 6 h at 37°C with or without preincubation of haloperidol (1 μm for 5 min), pertussis toxin (PTX) (100 ng/ml for 12 h), N-[2-(p-bromocinnamyl-amino)ethyl]-5-isoquinolinesulfonamide (H-89) (1 μm for 20 min), and PD98059 (10 μm for 30 min). After treatment, the cells were lysed and assayed for luciferase activity using the luciferase assay system (Promega, Madison, WI), and luminescence was measured using a 96-well luminometer (Microlumat; EG & Berthold, Bad Wilbad, Germany). The expression of the reporter gene was normalized using β-galactosidase activity. Results are expressed as the ratio of luciferase activity of the transfected cells to that of the unstimulated control. The mean values of the data obtained were fitted to a sigmoid curve with a variable slope factor using nonlinear squares regression in GraphPad Prism software. Total RNA was prepared from isolated mesencephalon of mice brain using LiCl RNA extraction buffer. First-strand cDNAs were generated from total RNA using reverse transcription with random primer by denaturing at 90°C for 4 min, annealing at room temperature for 10 min, and extending at 42°C for 50 min. The following primers were used to amplify target cDNA: PTX3, 5′-AGGACGGCTCTCTGAAGAA-3′, 5′-TTGACCGAGTTGAAGGCGAA-3′; β-actin, 5′-GATGACGATATCGCTGCGCT-3′, 5′-GCTCATTGCCGATAGTGATGACCT-3′. Conditions for PCR amplifications were as follows: 94°C for 5 min, 30 cycles at 94°C for 1 min, 60°C for 1 min, 72°C for 1 min, and final extension at 72°C for 7 min. The PCR products were run on 1.5% agarose gels containing ethidium bromide (0.5 μg/ml), to mark and visualize the PCR products. For statistical analyses, a two-sample comparison was performed using Student's t test, and multiple comparisons were made using one-way ANOVA followed by appropriate post hoc comparisons. To determine whether the absence of D2R might affect the development of dopaminergic neurons, we initially conducted a comparison of the numbers of dopaminergic neurons in the mesencephalic neuronal cultures of WT and D2R−/− mice embryos. We measured the basal numbers of TH-immunoreactive neurons in both WT and D2R−/− mice, and surprisingly, the number of detected TH-immunoreactive neurons was substantially lower in the D2R−/− mice than in the WT mice, having been reduced to ∼65% of the number of TH-positive neurons observed in the WT mice (Fig. 1). Because the overall numbers of mesencephalic neurons are similar in the WT and D2R−/− mice (data not shown), it appears likely that the absence of D2R exerts a specific influence on the dopaminergic neurons. 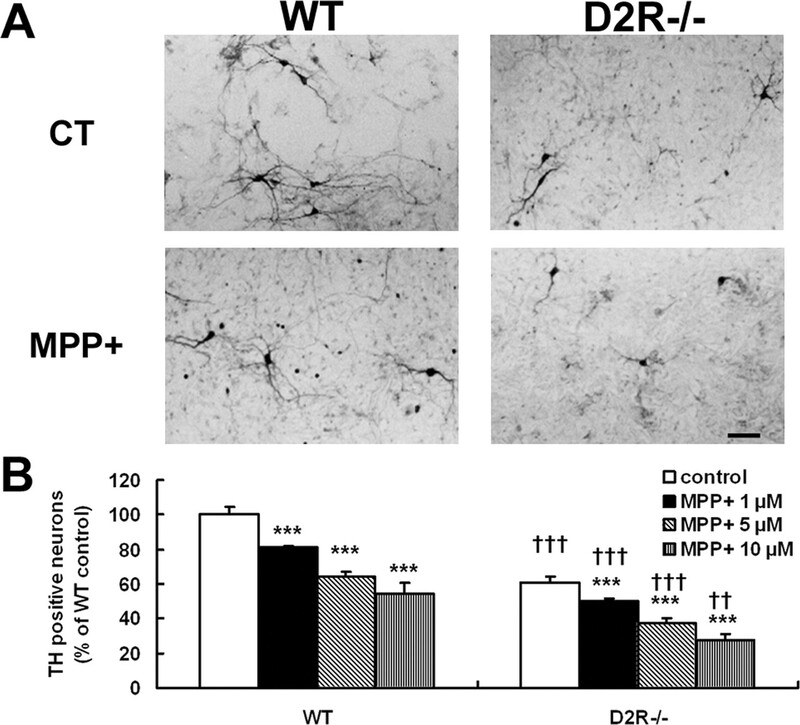 To determine whether the absence of D2R might also affect the survival of the mesencephalic dopaminergic neurons, we administered MPP+ to the primary mesencephalic dopaminergic neuronal cultures from the WT and D2R−/− mice, at concentrations ranging from 1 to 10 μm (Fig. 1). In mesencephalic cultures of D2R−/− mice, treatment with 10 μm MPP+ resulted in a more significant loss of dopaminergic neurons as was observed in the cultures from WT mice (Fig. 1B). At a concentration of 10 μm, MPP+ reduced the number of surviving TH-immunoreactive neurons to ∼54% of control levels in the WT mice, and by up to 40% in the D2R−/− mice (27% of control from WT) (Fig. 1B; supplemental Fig. 1, available at www.jneurosci.org as supplemental material). Therefore, the effects of MPP+ were stronger in the mesencephalic cultures from D2R−/− mice than in the WT mice, thereby suggesting that, in the absence of D2R, dopaminergic neurons become more susceptible to MPP+ toxicity. Thus, in the absence of D2R, the number of dopaminergic neurons is clearly reduced, and D2R appears to be also important for dopaminergic neuronal survival. We next assessed TH expression in the WT and D2R−/− mice embryos, in the substantia nigra and the ventral tegmental regions. Stereological counts of the TH-positive neurons in the brain sections from E14 of the WT and D2R−/− embryos indicated that the number of TH-expressing cells was significantly reduced in the ventral tegmentum and SN of D2R−/− mice (70% of WT mice) (Fig. 2A). These findings strongly suggest that D2R plays an important role in the development of mesencephalic dopaminergic neurons. In mice aged 1 month (P30), stereological cell counting analysis revealed that the number of TH neurons was still lower in the D2R−/− mice than in the WT mice, by ∼62% in SN region and 54% in VTA region (Fig. 2A). Therefore, the absence of D2R appears to influence the dopaminergic neuronal development. The expression levels of the two transcription factors, Nurr1 and Ptx3, were also analyzed in WT and D2R−/− mice during development. Nurr1, an orphan nuclear receptor, is expressed in the ventral midbrains of mice before the appearance of TH, and its expression continues in the mature dopaminergic neurons during adulthood. Ptx3, a homeodomain transcription factor, is expressed uniquely in the dopaminergic neurons of the substantia nigra pars compacta and the ventral tegmental region (Perrone-Capano and Di Porzio, 2000; Riddle and Pollock, 2003). Immunohistochemical and stereological analysis indicated that Nurr1 expression had decreased significantly in D2R−/− mice in the embryonic stage, to 70% of the levels measured in the WT mice (Fig. 2B). In mice aged 1 month (P30), the number of Nurr1-labeling cells in the D2R−/− mice was still reduced, showing ∼86% of the number of Nurr1-labeling cells of WT mice (Fig. 2B). 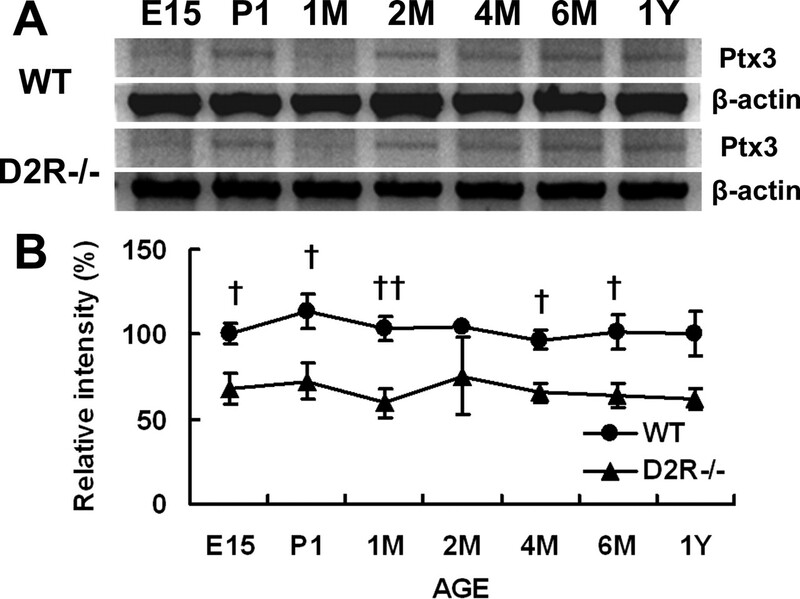 The Ptx3 expression level was also decreased in the D2R−/− mice, which exhibited a Ptx3 expression level of ∼70% that of the WT mice, and this decrease persisted throughout development in the D2R−/− mice (Fig. 3). Because the expression of both TH and Nurr1had been reduced in the D2R−/− mice, we hypothesized that D2R might play a critical role in this regulation. We first attempted to determine whether D2R stimulation might induce Nurr1 activation. We conducted a NurRE-dependent reporter gene activation assay on D2R activation, by transfecting Nurr1 and D2R into HEK293T cells, coupled with the NurRE-Luc construct, a luciferase reporter gene driven by the POMC promoter containing NurRE (Philips et al., 1997a,b; Maira et al., 1999). Dopamine treatment elicited a dose-dependent luciferase activation, indicating that D2R stimulation induced the activation of Nurr1 and NurRE-dependent transcription, resulting in an increase by 80% compared with the control levels (Fig. 4A). In the absence of either D2R or Nurr1, reporter gene activity was not induced after dopamine stimulation. Treatment with haloperidol, a D2R antagonist, completely blocked this dopamine-induced NurRE-dependent transcriptional increase, thereby indicating that this transactivation of Nurr1 is mediated specifically by D2R (Fig. 4B). 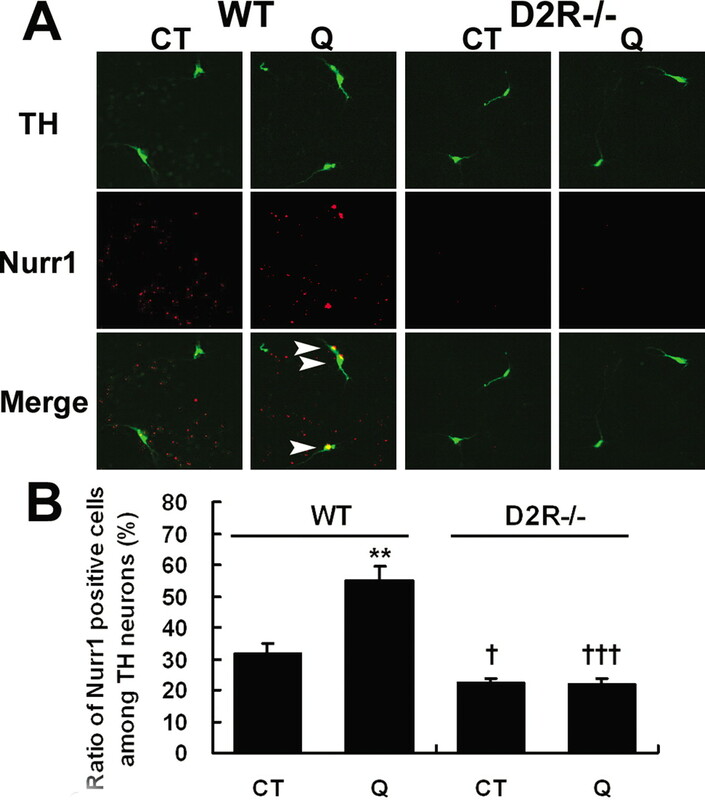 The D2R-mediated stimulation of NurRE activity was also blocked by PTX, showing that D2R-mediated signaling is crucial for the activation of Nurr1 (Fig. 4C). Nurr1 activation has been reported to be dependent on the activation of protein kinase A (PKA) and ERK (Kovalovsky et al., 2002). Because D2R-mediated signalings also exploit these signaling pathways (Choi et al., 1999; Kim et al., 2004), we analyzed the involvement of PKA and ERK activation in D2R-mediated NurRE-dependent transactivation. As is shown in Figure 4D, D2R-mediated NurRE-dependent transcription was blocked completely by the administration of the mitogen-activated protein (MAP) kinase kinase inhibitor, PD98059, thereby indicating that this signaling is dependent on the ERK pathway. Because D2R is known to use Ras-ERK signaling, we attempted to characterize the role of Ras in D2R-mediated NurRE-dependent transactivation. As is shown in Figure 4E, the expression of the dominant-negative mutant form of Ras, RasN17, resulted in a significant inhibition of D2R-mediated NurRE-dependent transcription. These results demonstrate that the regulation of NurRE activity exerted by dopamine D2R is controlled by the ERK pathway. By way of contrast, treatment with the PKA inhibitor, H-89, had no effect on D2R-mediated NurRE activity (Fig. 4F). Other dopamine receptor subtypes, including D1R, did not induce reporter gene activity under identical experimental conditions (Fig. 4G). Therefore, our data strongly indicated that D2R specifically activates Nurr1, via ERK signaling. To determine whether D2R-induced ERK signaling and Nurr1 activation could be correlated with the role of D2R in dopaminergic neuronal development, we attempted to characterize the direct effects of a D2R agonist on the dopaminergic neurons and on signaling occurring in the primary mesencephalic cultures. Primary mesencephalic cultures from WT and D2R−/− mice were prepared and treated with quinpirole for 4 d. After 4 d of culture, the cells were fixed and the TH-positive cells were counted. In the mesencephalic primary cultures from WT mice, quinpirole treatment was shown to have increased the number of TH neurons by 20%, but this effect was not detected in the cultures from D2R−/− mice (Fig. 5A,C). We also determined that quinpirole treatment induced morphogenic effects, resulting in the neuritic extension of the dopaminergic neurons. Quinpirole treatment induced an increase in the average length of the neurites and the arborization of neuronal processes, as shown in Figure 5, A (panel Q in WT) and C.
To confirm that the observed effects of quinpirole occurred specifically via D2R, we administered haloperidol to quinpirole-treated mesencephalic neurons. As shown in Figure 6, haloperidol treatment completely blocked the effects of quinpirole in mesencephalic neuronal cultures from WT mice, whereas haloperidol induced no changes with regard to both the number of TH-positive neurons (Fig. 5B) and neuritic extension (Fig. 5C) in the cultures from D2R−/− mice. Therefore, as we had hypothesized, D2R-mediated signalings can play a critical role in mesencephalic dopaminergic neuronal development, and in the absence of D2R, this regulation was blunted. We then attempted to ascertain whether or not the D2R-mediated enhancement of dopaminergic neuronal development involves the ERK pathway, by treating the mesencephalic neurons with the MEK (MAP kinase kinase) inhibitor, PD98059. PD98059 treatment was shown to prevent the quinpirole-induced increase of TH-positive neurons, and also resulted in a reduction in the number of TH-positive neurons by 80% of control levels in the WT mice. However, no such significant difference was observed in the cultures from the D2R−/− mice (Fig. 5A,B). Also, the average length of neurites was reduced in the mesencephalic TH neurons in cultures from the WT mice as the result of PD98059 treatment. The effects of quinpirole on the TH neurons in cultures from WT mice were blunted by cotreatment with PD98059 (Fig. 5A,C). By way of contrast, the effects of quinpirole with regard to the neuritic extension of dopaminergic neurons were not affected significantly by additional PD98059 treatment in cultures from the D2R−/− mice (Fig. 5C). These findings demonstrated that dopamine-induced dopaminergic neuronal development depends on the presence of the D2 receptor and on the ERK pathway. We then investigated whether or not quinpirole treatment induced the activation of ERK and Nurr1 in the dopaminergic mesencephalic neurons. As shown in Figure 6A, quinpirole treatment induced ERK activation in the TH-positive neurons of WT mice, but this activation was not detected in D2R−/− mice, as evidenced by the results of double immunofluorocytochemical analysis coupled with confocal microscopy. This quinpirole-induced activation of ERK was also detected via Western analysis from quinpirole-treated primary cultures of WT mice, but not in cultures of D2R−/− mice under identical conditions (Fig. 6B). Quantitative analysis revealed that quinpirole treatment induced an ∼140% increase in ERK activation compared with the control cells (Fig. 6C). 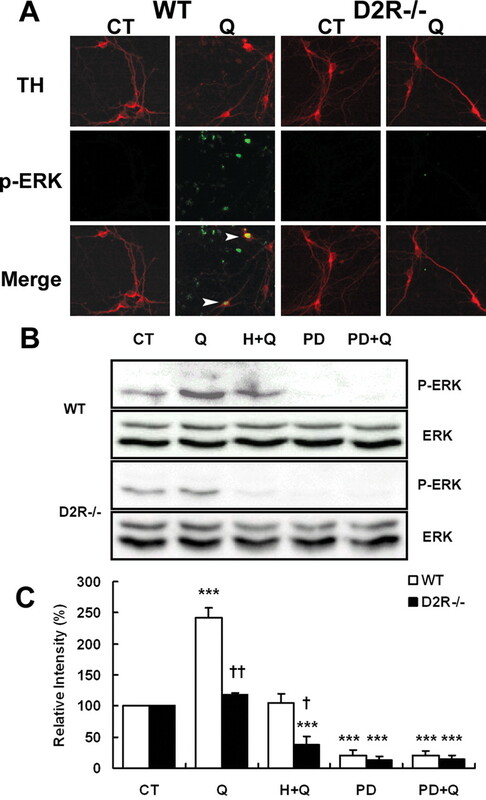 These results show that ERK activation occurs in response to D2R stimulation in mesencephalic dopaminergic neurons and that, without D2R, ERK signaling is hardly detectable in the TH-positive neurons. We also attempted to determine whether D2R activation might induce Nurr1 activation in the dopaminergic neurons, via the double-immunofluorescent labeling of Nurr1 and TH, followed by confocal microscopic analysis. When we compared the levels of Nurr1 expression in the TH-positive cells from the control mesencephalic neuronal cultures of WT and D2R−/− mice, we found that the relative ratios for the Nurr1–TH-positive cell populations were significantly lower in the mesencephalic cultures from D2R−/− mice (Fig. 7A,B). In the WT mice, after 6 h of quinpirole treatment under our experimental conditions, we observed a pronounced augmentation in the percentage of Nurr1–TH colocalization, with a concomitant increase in Nurr1 expression, compared with what was observed in the control cells (Fig. 7A,B). However, we detected no changes in Nurr1 expression and no significant Nurr1–TH colocalized cells in the mesencephalic cultures from D2R−/− mice counterparts (Fig. 7A,B). We attempted to analyze the relative ratios of the presence of Nurr1–TH colocalized cells after quinpirole treatment and found that the treatment induced a ∼75% increase in the number of Nurr1–TH colocalized cells in the treated TH neurons from WT mice but exerted no detectable effects in TH neurons from D2R−/− mice (Fig. 7B). These findings provide strong evidence that D2R stimulation selectively employs ERK signaling and Nurr1 activation in the mesencephalic dopaminergic neurons and that these signalings might play critical roles in the D2R-mediated control of dopaminergic neuronal development. In the present study, we determined that the dopamine D2R plays a crucial role in the development of dopaminergic neurons, via the ERK pathway and the activation of Nurr1. As a result of these findings, we suggest a new connection, in which dopaminergic neurons activate ERK signaling via mesencephalic dopamine receptors, which in turn activates the transcription factor, Nurr1, a prerequisite for the development of dopaminergic neurons (supplemental Fig. 2, available at www.jneurosci.org as supplemental material). The dopamine D2R is known to be a principal subtype of dopamine receptor, which is first expressed in the mesencephalon around E12 or earlier [The Gene Expression Nervous System Atlas Project; http://www.ncbi.nlm.nih.gov/entrez/query.fcgi?db=gensat&doptcmdl=Detail&term=7245] (Mack et al., 1991). The dopamine D2-like receptors have been suggested to be involved in a variety of important modulations of mesencephalic dopaminergic cell function (Groves et al., 1975; Meiergerd et al., 1993; Swarzenski et al., 1994; Cragg and Greenfield, 1997). Dopamine D2R expressed in the midbrain during the embryonic stage thus may function as a dopaminotrophic factor, which facilitates the maintenance of the secure development of dopaminergic neurons during this critical period. The loss of autoreceptor functions in D2R−/− mice has been demonstrated previously (Mercuri et al., 1997). Our observations are consistent with several reports that the D2-like receptors may play a critical role in the dopaminergic neuronal development. The D2-like receptors have been theorized to play specific roles in the regulation of the neuronal morphogenesis of dopaminergic pathways (Swarzenski et al., 1994; Guo et al., 2002; Wang et al., 2004). Recently, the D2-like receptors have also been suggested to play a role in the modulation of adult neurogenesis (Hoglinger et al., 2004), as evidenced by observations of the dopaminergic regulation of neural precursor cell proliferation via D2-like receptors occurring in the adult mammalian brain. It is, therefore, somewhat tempting to speculate that dopamine employs specific signaling, via D2-like receptors, to control the development of dopaminergic neurons not only during embryonic stages, but also during adult neurogenesis. In this study, our stereological cell counting analyses of dopaminergic neuronal cells permitted us to measure the differences in the numbers of TH-positive cells in both WT and D2R−/− mice. Indeed, it is actually fairly difficult to characterize the differences in actual neuronal cell numbers by conventional analyses, which compare positive immunoreactive cells or radiolabeled cells on a planar basis in sectioned samples, rather than taking the three-dimensional aspects of the brain into account. It has been suggested that the precise anatomical localization and functional differentiation of dopaminergic neurons in the mammalian brain is achieved via diffusible factors, including SHH (Sonic Hedgehog) and FGF8 (fibroblast growth factor), both of which constitute requisite factors for dopaminergic neuronal induction (Hynes et al., 1995; Ye et al., 1998). These factors appear to subsequently activate cascades of other signaling molecules and transcription factors, resulting in the final differentiation of the dopaminergic neurons. Two transcription factors, Nurr1 and the homeodomain-related Ptx3, both of which are expressed at crucial times in differentiating midbrain dopaminergic cells, have been identified, as has Limbx1, in recent studies (Smidt et al., 1997, 2000; Zetterström et al., 1997; Perrone-Capano et al., 2000). It has been consistently reported that the absence of Nurr1 in knock-out mice resulted in the agenesis of dopaminergic neurons in the midbrain, and a consequent lack of striatal dopamine innervation (Zetterström et al., 1997; Castillo et al., 1998; Saucedo-Cardenas et al., 1998). The mechanisms underlying the regulation of Nurr1 activity during dopaminergic neuronal development have been extensively studied. The majority of these studies, however, have been rather tightly focused on the identification of Nurr1-regulating factors, or on definitions of the manner in which Nurr1 is regulated, to determine whether other signaling pathways use Nurr1 as a downstream target, because the ligand of this receptor has yet to be identified. This study, however, may provide novel insight into this puzzling aspect of Nurr1 regulation, by showing for the first time the interactions and signaling pathways between dopamine via D2R and Nurr1. Our results also point to cross talk occurring between a nuclear receptor and a membrane receptor, a fairly important aspect. Dopamine has previously been shown to function as a physiological activator of the chicken ovalbumin upstream promoter transcription factor, a member of the orphan steroid receptor family (Power et al., 1991). It has also been demonstrated that the activation of dopaminergic pathways via D1-like receptors might modulate reproductive behavior via the activation of progesterone receptors, in the absence of its cognate ligand (Apostolakis et al., 1996). One of the key observations of this paper is that dopamine D2R functions as a potent Nurr1 activator, and we were also able to define the role of ERK as an important signaling mediator, linking D2R and Nurr1. Our observations indicate that Nurr1 is certainly important with regard to the continued development and maintenance of dopaminergic cells during early development but that this maintenance is assured by the signaling mediated by mesencephalic dopamine D2R. It remains, however, to be explained how the development of dopaminergic neurons can be tuned to a certain degree during ontogeny, despite the initial severe perturbations associated with the expression of Nurr1 and TH. One possibility involves the presence of another dopamine autoreceptor, D3, which appears to serve similar functions during development, and then partially compensates for Nurr1 expression at later stages of development. Therefore, it will be necessary in the future to elucidate the presence of other regulatory factors involved with the dopaminergic neurons during critical developmental stages, and how they may be induced from different environmental cues during development. Ptx3 is induced at a later stage, and its expression in the brain is confined to the dopaminergic neurons (Smidt et al., 1997; Burbach et al., 2003). Ptx3 expression has been suggested to be independent of Nurr1, and we also detected distinct expression Ptx3 regulation patterns, compared with those associated with Nurr1. 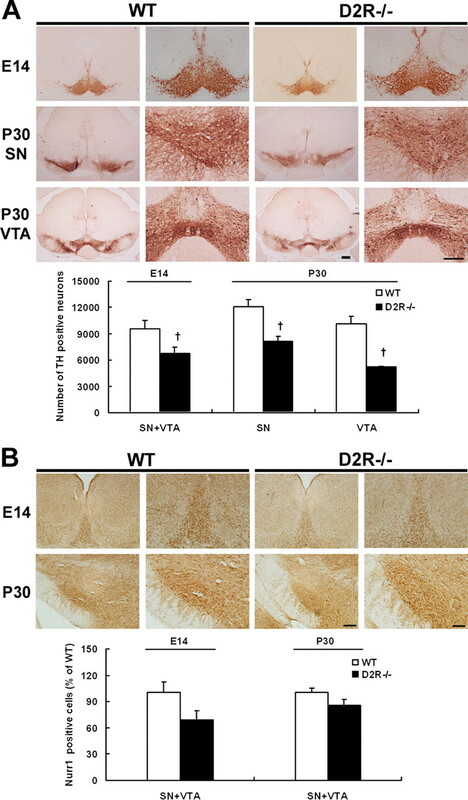 It has been recently reported that Wnt-5a induces an increase in Ptx3 expression, and efficiently promotes the acquisition of a dopaminergic phenotype in Nurr1-expressing precursors (Castelo-Branco et al., 2003). In addition, van den Munckhof et al. (2003) reported that Ptx3 was a prerequisite for motor activity, as well as for the survival of a subset of midbrain dopaminergic neurons. Thus, it would be also interesting to determine whether Ptx3 can still contribute to the survival of dopaminergic neurons in D2R-deficient mice. What is the role of Nurr1 in adult dopaminergic neurons, and what impact can be imputed to the cross talk occurring between D2R and Nurr1 in dopaminergic neurons of adult stage, assuming it still occurs? Wallén-Mackenzie et al. (2003) have proposed that Nurr1 may promote neuronal survival, contributing to the maintenance of mature dopaminergic neurons. Accordingly, the dopaminergic neurons of Nurr1 heterozygous mice appear to be more susceptible to the neurotoxin 1-methyl-4-phenyl-1,2,3,6-tetrahydropyridine (MPTP) (Le et al., 1999). This is consistent with the observations made in this study, in which the dopaminergic neurons of D2R−/− mice were found to exhibit elevated susceptibility to neurotoxin MPTP because of the reduced expression of Nurr1 in these mice. Nurr1 may, then, promote the survival of dopaminergic neurons in adult mice via similar mechanisms. It will be also challenging to explore the dopamine-associated regulation of the molecular interaction of Nurr1 with other binding partners, including the retinoid X receptor, in this context. In conclusion, the findings of this study provide us with new insights into the network inherent to the development of dopaminergic neurons, with interactions occurring between the mesencephalic dopamine D2R and the orphan nuclear receptor, Nurr1. Additional studies should attempt to determine whether our findings represent a unique circuit for the homeostatic regulation of dopaminergic neuronal development or whether they can be generalized, for example, to mature dopaminergic neurons, in which Nurr1 may contribute to the survival of mature dopaminergic cells in vivo. Our findings should also be applied to other situations in which neural plasticity would be required to cope with novel environments, including stress and drug addiction (Bannon et al., 2002), both of which have been linked to neurological and psychiatric disorders involving the dopaminergic neurotransmission system. This work was supported by a basic research grant from the Korea Science and Engineering Foundation (Grant R01-2004-000-10671-0) and by a grant from the Brain Research Center of the 21st Century Frontier Research Program (Grant M103KV010020-03K2201-02030, M103KV010020-05K2201-02030) funded by the Research Program of the Korean Ministry of Science and Technology. We especially thank Dr. Y. J. Oh (Yonsei University, Seoul, South Korea) and Drs. W. Sun and H. Kim (Medical School, Korea University, Seoul, South Korea) for their help and advice. We also thank Dr. Jacques Drouin (Institut de Recherches Cliniques de Montréal, Montréal, Canada) for kindly providing the NurRE-Luciferase construct, Dr. Bert O'Malley (Baylor College of Medicine, Houston, TX), and Dr. H. S. Choi (Chonnam National University, Gwangju, Korea) for the Nurr1 plasmid. ↵*S.Y.K. and K.C.C. contributed equally to this work. An JJ, Bae MH, Cho SR, Lee SH, Choi SH, Lee BH, Shin HS, Kim YN, Park KW, Borrelli E, Baik JH (2004) Altered GABAergic neurotransmission in mice lacking dopamine D2 receptors. Mol Cell Neurosci 25:732–741. Apostolakis EM, Garai J, Fox C, Smith CL, Watson SJ, Clark JH, O'Malley BW (1996) Dopaminergic regulation of progesterone receptors: brain D5 dopamine receptors mediate induction of lordosis by D1-like agonists in rats. J Neurosci 16:4823–4834. Baik JH, Picetti R, Saiardi A, Thiriet G, Dierich A, Depaulis A, Le Meur M, Borrelli E (1995) Parkinsonian-like locomotor impairment in mice lacking dopamine D2 receptors. Nature 377:424–428. Bannon MJ, Pruetz B, Manning-Bog AB, Whitty CJ, Michelhaugh SK, Sacchetti P, Granneman JG, Mash DC, Schmidt CJ (2002) Decreased expression of the transcription factor NURR1 in dopamine neurons of cocaine abusers. Proc Natl Acad Sci USA 99:6382–6385. Burbach JP, Smits S, Smidt MP (2003) Transcription factors in the development of midbrain dopamine neurons. Ann NY Acad Sci 991:61–68. Castelo-Branco G, Wagner J, Rodriguez FJ, Kele J, Sousa K, Rawal N, Pasolli HA, Fuchs E, Kitajewski J, Arenas E (2003) Differential regulation of midbrain dopaminergic neuron development by Wnt-1, Wnt-3a, and Wnt-5a. Proc Natl Acad Sci USA 100:12747–12752. Castillo SO, Baffi JS, Palkovits M, Goldstein DS, Kopin IJ, Witta J, Magnuson MA, Nikodem VM (1998) Dopamine biosynthesis is selectively abolished in substantia nigra/ventral tegmental area but not in hypothalamic neurons in mice with targeted disruption of the Nurr1 gene. Mol Cell Neurosci 11:36–46. Choi EY, Jeong D, Park KW, Baik JH (1999) G protein-mediated mitogen-activated protein kinase activation by two dopamine D2 receptors. Biochem Biophys Res Commun 256:33–40. Cragg SJ, Greenfield SA (1997) Differential autoreceptor control of somatodendritic and axon terminal dopamine release in substantia nigra, ventral tegmental area and striatum. J Neurosci 17:5738–5746. Groves PM, Wilson CJ, Young SJ, Rebec GV (1975) Self inhibition by dopaminergic neurons. Science 190:522–529. Gundersen HJ, Bagger P, Bendtsen TF, Evans SM, Korbo L, Marcussen N, Moller A, Nielsen K, Nyengaard JR, Pakkenberg B (1998) The new stereological tools: dissector, fractionator, nucleator and point sampled intercepts and their use in pathological research and diagnosis. Acta Pathol Microbiol Immunol Scand 96:857–881. Guo H, Tang Z, Yu Y, Xu L, Jin G, Zhou J (2002) Apomorphine induces trophic factors that support fetal rat mesencephalic dopaminergic neurons in cultures. Eur J Neurosci 16:1861–1870. Hoglinger GU, Rizk P, Muriel MP, Duyckaerts C, Oertel WH, Caille I, Hirsch EC (2004) Dopamine depletion impairs precursor cell proliferation in Parkinson disease. Nat Neurosci 7:726–735. Hynes M, Porter JA, Chiang C, Chang D, Tessier-Lavigne M, Beachy PA, Rosenthal A (1995) Induction of midbrain dopaminergic neurons by sonic hedgehog. Neuron 15:35–44. Kim SJ, Kim MY, Lee EJ, Ahn YS, Baik JH (2004) Distinct regulation of internalization and mitogen-activated protein kinase activation by two isoforms of the dopamine D2 receptor. Mol Endocrinol 18:640–652. Kovalovsky D, Refojo D, Liberman AC, Hochbaum D, Pereda MP, Coso OA, Stalla GK, Holsboer F, Arzt E (2002) Activation and induction of NUR77/NURR1 in corticotrophs by CRH/cAMP: involvement of calcium, protein kinase A, and MAPK pathways. Mol Endocrinol 16:1638–1651. Lankford KL, DeMello FG, Klein WL (1988) D1-type dopamine receptors inhibit growth cone motility in cultured retina neurons: evidence that neurotransmitters act as morphogenetic growth regulators in the developing central nervous system. Proc Natl Acad Sci USA 85:2839–2843. Le W, Conneely OM, He Y, Jankovic J, Appel SH (1999) Reduced Nurr1 expression increases the vulnerability of mesencephalic dopamine neurons to MPTP-induced injury. J Neurochem 73:2218–2221. Mack KJ, O'Malley KL, Todd RD (1991) Differential expression of dopaminergic D2 receptor messenger RNAs during development. Brain Res Dev Brain Res 59:249–251. Maira M, Martens C, Philips A, Drouin J (1999) Heterodimerization between members of the Nur subfamily of orphan nuclear receptors as a novel mechanism for gene activation. Mol Cell Biol 19:7549–7557. Meiergerd SM, Patterson TA, Schenk JO (1993) D2 receptors modulate the function of the striatal transporter for dopamine: kinetic evidence from studies in vitro and in vivo. J Neurochem 61:764–767. Mercuri NB, Saiardi A, Bonci A, Picetti R, Calabresi P, Bernardi G, Borrelli E (1997) Loss of autoreceptor function in dopaminergic neurons from dopamine D2 receptor deficient mice. Neuroscience 79:323–327. Paxinos G, Franklin KBJ (2001) In: The mouse brain in stereotaxic coordinates Ed 2 San Diego: Academic. Perlmann T, Wallen-Mackenzie A (2004) Nurr1 an orphan nuclear receptor with essential functions in developing dopamine cells. Cell Tissue Res 318:45–52. Perrone-Capano C, Di Porzio U (2000) Genetic and epigenetic control of midbrain dopaminergic neuron development. Int J Dev Biol 44:679–687. Perrone-Capano C, Pozzo PD, Porzio U (2000) Epigenetic cues in midbrain dopaminergic neuron development. Neurosci Biobehav Rev 24:119–124. Philips A, Lesage S, Gingras R, Maira MH, Gauthier Y, Hugo P, Drouin J (1997a) Novel dimeric Nur77 signaling mechanism in endocrine and lymphoid cells. Mol Cell Biol 17:5946–5951. Philips A, Maira M, Mullick A, Chamberland M, Lesage S, Hugo P, Drouin J (1997b) Antagonism between Nur77 and glucocorticoid receptor for control of transcription. Mol Cell Biol 17:5952–5959. Power RF, Lydon JP, Conneely OM, O'Malley BW (1991) Dopamine activation of an orphan of the steroid receptor superfamily. Science 252:1543–1546. Riddle R, Pollock JD (2003) Making connections: the development of mesencephalic dopaminergic neurons. Brain Res Dev Brain Res 147:3–21. Saucedo-Cardenas O, Quintana-Hau JD, Le WD, Smidt MP, Cox JJ, De Mayo F, Burbach JP, Conneely OM (1998) Nurr1 is essential for the induction of the dopaminergic phenotype and the survival of ventral mesencephalic late dopaminergic precursor neurons. Proc Natl Acad Sci USA 95:4013–4018. Schmidt U, Beyer C, Oestreicher AB, Reisert I, Schilling K, Pilgrim C (1996) Activation of dopaminergic D1 receptors promotes morphogenesis of developing striatal neurons. Neuroscience 74:453–460. Simon HH, Bhatt L, Gherbassi D, Sgado P, Alberi L (2003) Midbrain dopaminergic neurons: determination of their developmental fate by transcription factors. Ann NY Acad Sci 991:36–47. Smidt MP, Schaick HS, van Lanctot C, Tremblay JJ, Cox JJ, Kleij AA, van der Wolterink G, Drouin J, Burbach JP (1997) A homeodomain gene Ptx3 has highly restricted brain expression in mesencephalic dopaminergic neurons. Proc Natl Acad Sci USA 94:13305–13310. Smidt MP, Asbreuk CH, Cox JJ, Chen H, Johnson RL, Burbach JP (2000) A second independent pathway for development of mesencephalic dopaminergic neurons requires Lmx1b. Nat Neurosci 3:337–341. Swarzenski BC, Tang L, Oh YJ, O'Malley KL, Todd RD (1994) Morphogenetic potentials of D2, D3 and D4 dopamine receptors revealed in transfected neuronal cell lines. Proc Natl Acad Sci USA 91:649–653. Todd RD (1992) Neural development is regulated by classical neurotransmitters: dopamine D2 receptor stimulation enhances neurite outgrowth. Biol Psychiatry 31:794–807. Usiello A, Baik JH, Rouge-Pont F, Picetti R, Dierich A, LeMeur M, Piazza PV, Borrelli E (2000) Distinct functions of the two isoforms of dopamine D2 receptors. Nature 408:199–202. van den Munckhof P, Luk KC, Ste-Marie L, Montgomery J, Blanchet PJ, Sadikot AF, Drouin J (2003) Pitx3 is required for motor activity and for survival of a subset of midbrain dopaminergic neurons. Development 130:2535–2542. Wallén-Mackenzie Å, Mata de Urquiza A, Petersson S, Rodriguez FJ, Friling S, Wagner J, Ordentlich P, Lengqvist J, Heyman RA, Arenas E, Perlmann T (2003) Nurr1-RXR heterodimers mediate RXR ligand-induced signaling in neuronal cells. Genes Dev 17:3036–3047. Wang X, Li X, Wang K, Zhou H, Xue B, Li L, Wang X (2004) Forskolin cooperating with growth factor on generation of dopaminergic neurons from human fetal mesencephalic neural progenitor cells. Neurosci Lett 362:117–121. Ye W, Shimamura K, Rubenstein JL, Hynes MA, Rosenthal A (1998) FGF and Shh signals control dopaminergic and serotonergic cell fate in the anterior neural plate. Cell 93:755–766. Zetterström RH, Solomin L, Jansson L, Hoffer BJ, Olson L, Perlmann T (1997) Dopamine neuron agenesis in Nurr1-deficient mice. Science 276:248–250.